Amoji Unisex Garden Clogs Shoes Sandals House Slippers Room Shoes Indoor Outdoor Shower Shoes Sport Women Men Ladies Black 13.5-14.5 US W/11.5-12.5 US M | What Should I Say? 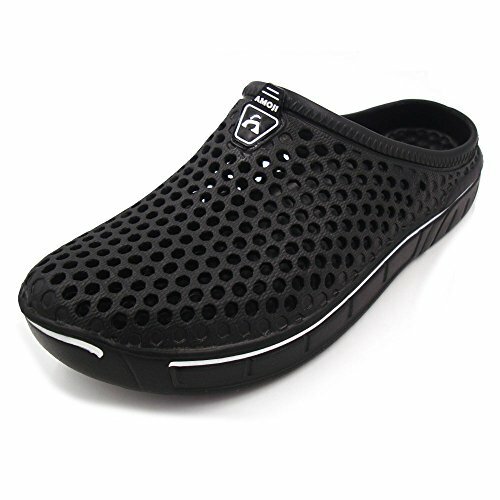 Brand:Amoji offers an unparalleled of water shoes,from lightweight sandals,multi-functional water shoes and sneakers,through to the ultimate in casual and comfortable lifestyle. MULTI -USE:You can use the shoes for house slippers when you relaxing in you home,you can wear this shoes just go walk with your dog in the afternoon also,you can take this shoes to to garden or yard or nurse working,or just enjoy the sport activities like the swim or water class. PORTABLE AND IDORLESS:ultra-lightweight,a shoe weight from 120-130g which convenient for you to take it on your bag,moreover,this garden shoes use the high quality material can make sure the shoes odorless.